Employees are asked to self-rate their performance for each of their goals under the Goals tab, as well as each of the SMU core competencies under the Competencies tab. Managers will also select a rating for each of the employee’s goals and each competency. 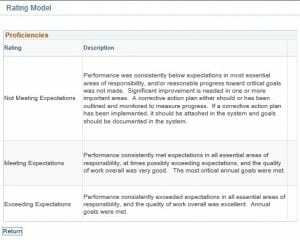 A description for each rating is provided in the Performance Document so that employees and Managers are using a consistent definition when making a selection. Click the pop-out icon to review the rating descriptions within the system. Performance was consistently below expectations in most essential areas of responsibility, and/or reasonable progress toward critical goals was not made. Significant improvement is needed in one or more important areas. A corrective action plan either should or has been outlined and monitored to measure progress. If a corrective action plan has been implemented, it should be attached in the system and goals should be documented in the system. Performance consistently met expectations in all essential areas of responsibility, at times possibly exceeding expectations, and the quality of work overall was very good. The most critical annual goals were met. Performance consistently exceeded expectations in all essential areas of responsibility, and the quality of work overall was excellent. Annual goals were met. Both the manager and the employee should use these descriptions when selecting a rating for each goal and each competency. The Goals tab and the Competencies tab include a Summary Section at the bottom. Click the calculator icon at the bottom of each tab to average your ratings for Goals and for Competencies. Comments may also be added in the text box field under tab. The next step will average the Goals and the Competencies section for an overall rating of the Goals and the Competencies sections. Just above the Goals and the Competencies tabs, click the “Overall Status” button. Questions? Email us at SMUHR@smu.edu.